Dairy Crest, makers of some of the UK’s best-loved food brands, has upgraded its wastewater treatment process by investing in a new mixing system from Landia. 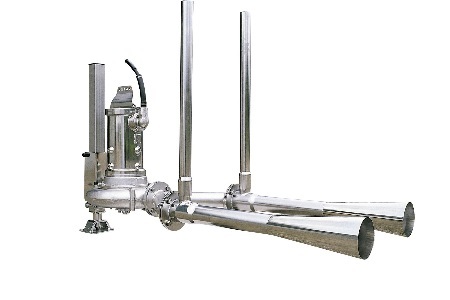 Four new stainless steel AirJets, which incorporate the chopper pump that Landia invented back in 1950, have been installed in balance tanks that require thorough mixing. “Initially we did a try-before-you buy with Landia, renting an AirJet unit at low cost to put it through its paces. It proved robust, reliable and effective”. He added: “As demand for our products has increased, so has the need to increase our production capacity, so it is important that we invest in top quality equipment with a long lifespan and low maintenance. Landia’s AirJet very much meets these requirements – and removes the cost of adding chemicals or using energy-intensive blowers”. Supplied on free-standing frames for easy servicing, the Landia AirJet (consisting of a Landia chopper pump and an ejector system) is designed with a highly effective knife system that stops the aerator from becoming clogged by solids. Producers of household-name brands such as Cathedral City, Clover and Vitalite, Dairy Crest works in close partnership with farmers to help their businesses grow and become more successful.